© John A. Moller, 1986. All rights reserved. No part of this publication may be reproduced, stored in a retrieval system or transmitted in any form or by any means, electronic, mechanical, photocopying, recording, or otherwise, without the prior written permission of the author. "The Punji Pit" was published in 1986 by The Tauranga Moana Press, 19 Roderick Street, Otumoetai, Tauranga, Aotearoa New Zealand (ISBN 0-908705-14-X). Cover illustration (used as the sidebar for the website) by John F. de Roo, Capt (ret) Netherlands East-Indies Army, WWII. "A collection of poetry written by John A. Moller and dedicated to the memory of young Australian and New Zealand soldiers who served in the South Vietnam Theatre of War. Just ordinary blokes who stood shoulder to shoulder in the jungles and padi fields of Vietnam and whose richness of spirit and quiet courage in the face of considerable adversity and suffering inspired the writing of these poems. (and not necessarily in that order)." The poems are stark and they are perceptive. They portray the paradox of the soldier at war - both the intense emotional involvement, and the bleak emotional disengagement. And they are forthrightly critical of those for whom this war was a matter of maintaining trade relations with the USA, at the expense of young men's lives. The literature about New Zealand's involvement in the Vietnam War is sparse, and in this regard the poems of "The Punji Pit" are an outstanding record of the war from the New Zealand soldier's viewpoint. More than that, they are a highly perceptive commentary on the reasons for our involvement, and the aftermath. "I visited John Mollers website and it is bloody outstanding. I think that he wrote some of the best verse to come out of the Vietnam war. ... Some of his stuff is just brilliant and right up there with Owens and Sassoon. Excellent." The original edition of "The Punji Pit" included an Honour Roll of the seven members of Whiskey Two Company who gave their lives. John has asked that this be expanded to include all thirty-nine New Zealanders who died, and this has been done for the online edition. John has graciously agreed that the foreword and the poems be published on the Web, and has also undertaken to provide more poems written since 1986. The webmaster acknowledges John's generosity, and acknowledges also that copyright remains with John A.Moller. John Moller joined the New Zealand Army at 16 years of age and at 21 was selected to undergo officer training in Australia. 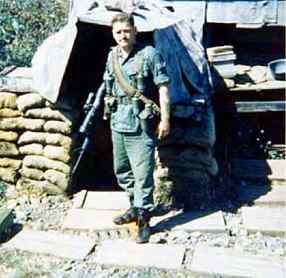 In 1968 - 69 Lieutenant Moller served as a platoon commander with Whiskey 2 Company in Vietnam as part of the 4 RAR/NZ and 6 RAR/NZ ANZAC infantry battalions of the 1st Australian Task Force based at Nui Dat in the Phuoc Tuy Province. He served for about another eight years after Vietnam, a total of 17 years service to his country. Since his retirement from the Army John has been a leading advocate of veterans rights, and has been the President of the Vietnam Veterans Association of New Zealand since its inception in the early 1980s. His poetry is published in a number of anthologies, and in books about Vietnam. Foreword to "The Punji Pit"
The punji pit was an animal trap adapted by the Viet Cong for use against soldiers of the Free World Forces during the Vietnam War. It was a camouflaged pit placed on jungle paths which contained fire hardened spikes of bamboo designed to pierce the boot of a soldier. The bamboo stakes were often smeared with human or animal excreta in order to promote septicaemia of the wound, and they were placed at angles which made the extraction of the victim's foot very difficult. In essence the punji pit reflects the true nature of the war in Vietnam. The United Stated military giant was trapped by an often unseen enemy who could concentrate and disperse his forces at will. The United States held fast to the belief that the campaign could be won by force of arms and the deployment of modern military technology. The simplicity of the punji pit versus the massive fire-power of the Free World Forces gives a true indication of the face of terrorist warfare. Disengagement from the fields of Vietnam was truly a long and painful process. For the first time in the history of war the soldiers serving the precepts of democracy began to question the morality and the conduct of a conflict, whose bloody face was brought into the living rooms of the world through the medium of television. The truths of the battlefield, long denied the civilian population through the use of censorship, were finally and brutally revealed. It was a mistake which the British Government did not repeat in the conduct of the Falklands War. "The Punji Pit" is a reflection of the hardships and suffering endured by young men caught up in the Vietnam War. It reveals the sacrifice and agony of an entire generation of young people, manipulated and committed to the cauldron of battle by the faceless political will of opposed ideologies. It is an indictment of the attitude of society in the United States that Vietnam veterans from that country finally had to fund and build their own monument to the fifty-eight thousand and twenty-two servicemen lost in the jungles and padi fields of Vietnam. Not only did the Vietnam campaign become a very unpopular expression of the national will, but in the end it was lost and the Vietnamese people were left to their fate. Thus, many veterans are still trapped in the moral punji pit of that conflict, and suffer from the bitter wounds which ripped their society apart during their service. I wrote "The Punji Pit" for two reasons. Firstly it is my monument to the quiet courage and graceful spirit of young men, both Maori and Pakeha, your sons and fathers, who in the end were not victims of the battlefield, but of selective morality. I wrote it too for a young Vietnamese man whose name I do not know but whose face I shall remember. He had been consigned to a barbed wire "tiger's cage" in a muddy field. He had no shelter from the searing heat of the sun, no food, no water. He was lying in tattered clothes within his cage in the stench of his own excreta. As I gave him a cigarette I saw within his eyes a quiet dignity and the certain knowledge that we would be repulsed from his land. I was glad. My sincere thanks to Robert de Roo of The Tauranga Moana Press who has pulled the canoe of this book through the portals of his literary and publishing experience. His patience and understanding in navigating the manuscript through the minefield of stanzas and syntax is gratefully acknowledged. Thanks also to my wife Lyn and my two sons who have provided much moral support in the production of the manuscript.